We use a number of items one time and toss it as soon as we’re finished every day. These items impact the environment, our bank account and even our health. By ditching the single use mentality, you can help the earth and save a little money, too. There’s plenty of single use items we can refuse and replace with better alternatives, given a little time and commitment to living a more sustainable life. 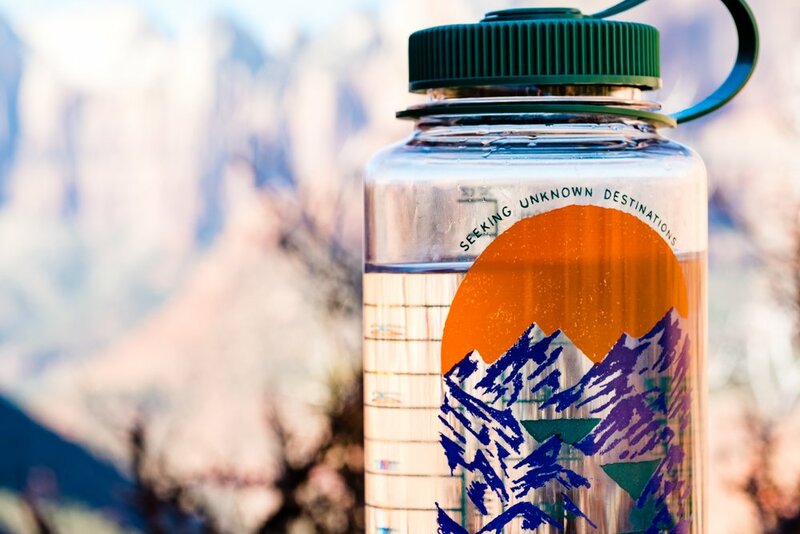 Say goodbye to single-use plastic water bottles and invest in your own reusable one. By carrying your own, you won’t have to ask for water and be handed the dreaded plastic cup, and you’ll also always be hydrated. Do your research and find one that works for you. Klean Kanteen and S’well are good metal alternatives. And while Nalgene is still made from plastic, it will last you a long time. If you live in DC (among other cities), you’ll actually get money back if you ditch this habit. I keep one with me that rolls up into a ball smaller than a tennis ball, but unfolds to a large bag when I need it. As for produce bags, you’re going to wash your food anyways. You may as well skip the bag, invest in some cheap ones, or shop at a grocery store that uses compostable bags. Whether you’re picking up takeout or hosting friends for a large gathering, say no to plastic utensils. Get a small reusable set to keep with you if you frequent the takeout counter (although if you’re living the V+B life, that’s doubtful) and offer up your silverware when you have friends and family over. At my house, we have a second set to accommodate more people. According to the National Park Service, Americans use 500 million straws each day. That number would fill over 125 school buses every day. Refuse the straw or invest in your own metal one. They may seem small, but they add up and wreak serious havoc on the environment - specifically our oceans. While you’re at it, you may as will skip the takeout container, too. At V+B, we use compostable containers, and we’ll even pick them up for you to compost. But that isn’t the case at most places. Instead, you can bring your own container and they will usually be happy to fill it up for you. It’s saving them resources, after all. And if you bike (extra green points), getting takeout will be infinitely easier - not to mention less messy. This one is easy to replace and you probably already have everything to do so. Either use old food containers to store items or invest in some glass storage containers if you haven’t already. If you want to take it a step further, you can purchase reusable beeswax food wrap or even reusable baggies that zip or Velcro shut. Buying pasta, rice, nuts, and other dry items doesn’t have to mean buying plastic. By shopping the bulk section, you can use the store’s paper bags or bring your own container - just ask them to tare it first so you don’t pay for the weight of your own container! Even nut butters, herbs, honey and detergent can be bought in bulk from a health food store or your local co-op. It doesn’t seem like a lot of waste, but it is. You have the box, the tea bag, the string, and the staple, which needs to be meticulously removed before being composted (if it’s even compostable). Loose leaf tea can be bought in metal containers and steeped in a tea ball or brew basket. These single-serve pods weren’t even easily recyclable until recently - and remember that recycling still takes resources. If you’re a fan of convenience, buy a refillable coffee pod and fill it with your favorite ground beans. If you want to try your hand at being a barista, a french press or a pour over with steel filter are sustainable options for your coffee needs. Don’t forget to buy organic and fair trade beans! If you’re in a rush or just have a favorite coffee shop, at least skip the lid. If you want to go the extra step, bring your own thermos or stick around an extra 10 minutes and enjoy your coffee from a mug. Dryer sheets actually have a combination of chemicals, like benzyl acetate and dichlorobenzene, that can harm your health and the environment. Not only are you putting them directly on your skin when you get dressed, but you’re releasing them into the air. To combat static electricity without a dryer sheet, either line dry your clothes or simply don’t over-dry them. You can also try 100% wool dryer balls, which reduce static and drying time. If you think you’ll miss the scent of dryer sheets, try adding some drops of your favorite essential oil to the dryer balls. To take your laundry to the next level, invest in laundry magnets that can be left in your washer and reused. You won’t be washing chemicals into the waterways, and you’ll never buy detergent again. I promise your clothes will be just as clean. This one takes a little getting used to, but will be an easy habit in just a month. Rags can be made from old t-shirts or towels, or bought from a thrift store. They can also be re-used over and over again. According to The Paperless Project, we could save 544,000 trees each year if every household in the U.S. used just one less 70-sheet roll of paper towels. And of course, you’re also saving money each time you pass up buying them. This is going to seriously reduce your overall consumption of single-use products and move you toward a zero-waste life if that’s your goal. You’ll notice that most of these items meant for single-use are plastic, which is astounding considering plastic can last hundreds of years. Remember that even if you’re recycling these plastic single-use items, that plastic needs to be processed, sold, shipped, melted, resold and shipped yet again. This is often a process that sends your bit of plastic all around the world. As with all habits, it takes time to change. I wouldn’t suggest starting tomorrow morning eliminating all of these but tackling a couple a week is a great challenge. Next time you run out of paper towels, cut up an old t-shirt instead of buying a new roll. Have a reusable pod ready for your coffee maker when you finish your single-use box. Take inventory of your kitchen and see what can be bought in bulk. Replace as you run out, and you’ll find yourself in a gradual transition to a more sustainable life.